The name of bomb plot suspect Faisal Shahzad was found with a suspect arrested in last week's raids, ICE says. Boston, Massachusetts (CNN) -- One of two men arrested in Massachusetts last week had an envelope with attempted Times Square bombing suspect Faisal Shahzad's name on it and a cell phone with Shahzad's name and phone number in its memory, a spokesman for Immigration and Customs Enforcement told CNN. Aftab Ali Khan and his uncle, Pir Khan -- along with a third man, Mohammad Rahman -- are believed to have been involved in an informal money transfer network that provided cash to Shahzad, U.S. officials said. But the Khans' lawyer, Saher Macarius, has said they had no connection with Shahzad. Macarius did not immediately return calls seeking comment on Thursday. However, on Wednesday he told CNN his clients do not know Shahzad, who is accused of leaving a faulty car bomb in Times Square on May 1, and did not give him money. Pir Khan and Aftab Ali Khan were arrested during law enforcement raids last Thursday in Massachusetts. According to the Pakistani consul general in Boston, Pir Khan is the uncle of Aftab Khan. 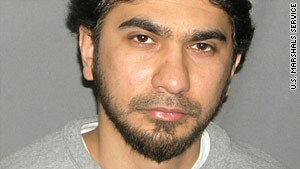 Rahman was taken into custody in Maine, and all three are being held on immigration charges. Macarius, whose practice is based in Framingham, Massachusetts, said the three men had booked flights for June 6 to fly from New York to Pakistan using the same route Shahzad had booked before he was arrested trying to leave the United States. The lawyer said Pir Khan had booked his flight April 27 and had even informed immigration officials of his travel plans. "If he was involved in anything shady, why would he wait until this explodes?" said Macarius. "He would have left earlier." U.S. officials have said the men detained last week were involved in an informal money transfer network that provided cash to Shahzad, although they may not have been aware of any terrorist plotting. Pakistan's consul general in Boston, Barry Hoffman, also told CNN this week the Khans do not know Shahzad, and it appears it was their flight plans that triggered law enforcement attention. Hoffman said that he has met with both men to check on their welfare. But the Khans' lawyer, Saher Macarius, said they do not know Shahzad and did not give him any money.